Should the government act like a venture capitalist? It might seem crazy to some, but in today’s eye-opening talk, economist Mariana Mazzucato shows why it might just work — and how it has, in fact, been working for decades. 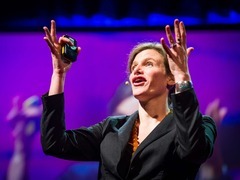 Mariana Mazzucato: Government -- investor, risk-taker, innovator In this talk, Mazzucato flips the script on the image of a big government meddling in economic affairs, and instead suggests that governments shape the market in revolutionary ways. In this talk, Mazzucato dissolves the dichotomy between the private and public sectors, and offers a bold vision of governments as entrepreneurs. Her talk raises big questions about the potential — and the risks — of entrepreneurial governments. Below, the TED Blog asks her some follow-up questions. A really great moment in your talk was when you described how so many of the revolutionary things in an iPhone were funded by the government. What other devices or objects are a big part of our lives, thanks to government funding? All the most important technologies that have driven growth — what economists call general purpose technologies — trace their funding back to government. These are the technologies whose effects permeate across large parts of the economy, not just a single sector, and nurture decades of growth. These include aviation technologies; space technologies; semiconductors, the Internet; nuclear power; and nanotechnology. So we’re not talking just gadgets here, but revolutionary technologies that drive innovation led-growth — and it’s these technologies that are embedded inside the gadgets. Elon Musk’s new car, the Tesla, would have never gotten off the ground without initial government support. The U.S. Government was Tesla’s venture capitalist. And government funding is increasingly required because venture capital — which was initially thought to provide the kind of early-stage high-risk finance that traditional banks won’t provide — is itself becoming risk-averse and short-termist, seeking returns in three to five years. Innovation, especially in science intensive areas, takes 15-20 years, not three! And that’s the point: truly radical innovation needs patient, long-term, committed finance. This type of finance is hard to find in the short-termist private sector. So it’s no surprise that modern capitalism has seen the increased role of the State in providing patient capital and directly investing in innovation development. Could you give us a few more specific technologies that are the product of government funding? All basic technologies that make our mobile phones “smart” can be traced back to governmental initiative and funding. Just a few: microprocessors; RAM memory; hard disk drives; liquid-crystal displays; lithium batteries; the Internet; cellular technology and networks; global positioning system (GPS); multi-touch screens. Take the GPS, for instance: it was an attempt by the Department of Defense to digitize global geographic positioning to enhance the coordination and accuracy of military assets. By the mid-1990s, civilian use of GPS quickly outnumbered military utilization following the release of the technology for commercial use. Nevertheless, to this day, the US Air Force continuously develops and maintains the system, which costs $705 million annually. From 1973 to 2000, the U.S. government invested $5.6 billion in developing the system. But government funding to radical technologies goes beyond the IT sector, and you can find the government fingerprints on many renewable energy technologies (solar, wind) or even in cars! For instance, the technologies that made the airbag a reality in the 1970s – those that enabled the device to sense a collision and inflate faster than a blink of an eye – all came from earlier state-funded military and space research. And of course the enormous spending of the National Institutes of Health ($792 billion from 1936-2011, in 2011 dollars, with $31 billion last year alone) has fuelled most of the innovation in both biotechnology and pharmaceuticals. Most of the new molecular entities with priority rating — the most innovative drugs — trace their funding to NIH. Is it the government’s responsibility to make these patient investments? Public sector agencies have been needed to provide the patient, long-term, committed finance that uncertain innovation with long-time horizons requires. Both Compaq and Intel got started with SBIR grants, and Apple also received $500K (which is the equivalent of about $1.8 million nowadays) from an SBIC grant. And in Nordic countries as well as in countries like Israel, public sector venture capital funds have been fundamental in getting new technologies and new companies off the ground. What is interesting is that the investments that led to these important innovations occurred irrespective of the business cycle. This is important because it is often believed that we simply need government to pull us out of the recession, with no real theory of government’s role in also driving the boom. But most of the public investments that led to these revolutionary new technologies occurred in boom periods. The investments were not just about fixing different types of market failures where private finance won’t fund roads and basic research because its hard to profit from them. They funded the basic research, the applied research all the way to early stage financing of companies themselves. As I argue in my new book, The Entrepreneurial State, governments were driven by big missions: going beyond the need to repair problems like a lack of investment that were created by market incentives. Isn’t there the danger that government will invest in the wrong technologies that eventually fail? The government got it right with the Internet, GPS, touchscreen display and the SIRI voice activated system, which make the iPhone so smart. To make these good decisions, you of course need serious expertise within government. And this is the most challenging bit: how to attract the brightest scientists into government agencies. DARPA, which was a key funder of the Internet, has thought about this dilemma and has been able to set up an intellectual environment where exploration of the uncertain future is welcomed rather than feared. This also holds today in ARPA-E, which is trying to do for energy what DARPA did for the Internet. I just visited ARPA-E last week and it feels like a Google campus when you walk in: open space, tech geeks, white boards everywhere, and lots of expertise riveting with dynamic energy. This shows that there is nothing in the DNA of the public sector that is going to make it less exciting or smart than the private sector, or less able to pick successes. I think there is a self-fulfilling prophecy: the more we talk down government the less able we are to get it to be driven by exciting missions and the less we are able to make the top graduates want to go work in government. But what about the recent case of Solyndra, the large solar giant that received a $500 million guaranteed loan from Obama and then went bust? Wasn’t that a failed government investment? Well, for all these successes, there are of course many failures. Indeed, for every Apple there is a rotten fruit somewhere. That is inherent in innovation, which is a very uncertain process based on trial and error, and serendipity. But while we are very quick to blame government for the failures like Solyndra, we don’t admit its role in the successes, such as the Internet or Apple. Solyndra received the same amount of money as Tesla. One ended in bankruptcy, the other, in success. Tesla received a $465 million loan from the Department of Energy in 2009, and on top of this, it has benefited from the massive funds that the government dishes out via federal and state incentives and rebates that increase sales, which drive profits. Venture capital also has wins and losses, but they are able to fund the losses through the wins. When the VC company Kleiner Perkins succeeded with its investment in Genentech, it was more than able to cover the losses it made. The government, on the other hand, has not been allowed to make gains; at best it simply gets its money back. So my work has been trying to encourage governments to not only think big and fund important new mission-oriented areas, but to also earn back a reward for this risk taking, just like VC. Economists traditionally think this will happen through the tax system. But this is no longer true. Both because many of the companies earning the benefits from this public sector’s risk-taking pay back very little in taxes, but also because they themselves are constantly asking for tax breaks of different kinds, which evidence shows don’t increase investment and innovation, only inequality. Where do you see the role of the American government in the recent healthcare debate? How do you think this discourse of a meddling government has shaped the conflict? The narrative about the State in the recent US government shutdown is very illuminating. The critique is that big government is bad for growth, and that programs like Obamacare “meddle in your healthcare.” Without taking sides in this heated debate, simply imagine how different the debate would be if we people understood the role that government has really played in the healthcare sector. Not only does the government regulate health, but it is one of the lead innovators. Most new molecular entities with priority rating trace their research back to public labs. And by not admitting it, not only do we describe its role in the wrong way, but we also don’t make sure that the taxpayer does not pay twice! We are socialising the risk, but privatising the rewards. Indeed, some authors have recently written about a case where a new medicine marketed by Genzyme treats a rare disease that was initially developed by scientists at the National Institutes of Health. They claim: “The firm set the price extremely high: $350,000 for a year’s dosage. And while legislation exists to make such drugs sell at ‘reasonable’ prices, the asymmetric power relation between the State and business has resulted in policy makers not taking advantage of that right”. So the taxpayer in fact is paying twice. In the US, what’s the history of governmental investment — have there been especially entrepreneurial administrations? Since World War II, US governments have provided stable support to industry and innovation. But this has often been hidden simply due to the very decentralized nature of this support. It was not through a ministry of research/innovation but through many different actors: the NSF, DARPA, SBIR, NASA, etc. Globally, what countries do you think are currently succeeding in finding a healthy balance between public and private entrepreneurship? I think the countries that are showing most promise are those where the narrative about the public and private is less ideological. I find inspiration in places like Finland, where massive state investments made this country go from being one of the least innovative in the OECD in the 1980s to the top of the charts today. Entrepreneurial state agencies like Sitra, which provided early stage seed finance to Nokia, retained equity and made a profit for the taxpayer that was then reinvested in a future round of funding. I think it’s that lack of ideology that really drives sensible and symbiotic private-public partnerships. I also find inspiration in places like Brazil, where the macro agenda is in line with the industrial/innovation agenda. This does not mean everything is rosy but it has meant that the vision, more or less, since Lula da Silva has been to tackle both innovation and poverty alleviation at the same time. If the public sector is key to innovation, then having the benefits return should allow there to be less tradeoffs. This is not what happened in Silicon Valley, where as I discuss at the end of my talk, the area has received massive government support, but public schools, for example, have not benefitted. (Indeed they are in a much worse state today than before those investments). That is not a symbiotic public-private partnership! I’m also interested in hearing more about your thoughts on BRIC economies — how do your ideas apply to China or other countries were the state has heavily controlled the economy, and there’s now huge growth in the private sector? I don’t really believe in the term BRIC. There is huge variety amongst those countries. I don’t, for example, see Russia playing as important a role in innovation as China and Brazil are playing. The latter two have industrial strategies that are deeply embedded in their growth strategies. China is spending $1.7 trillion dollars in the next five years on seven emerging areas that are all awe-inspiring: new engines (we still drive cars today with the same engine of almost 100 years ago! ); environmentally friendly technologies; new generation IT. And their China Development Bank is providing the type of patient long-term committed capital that innovation requires. Vallas, S. P., D. L. Kleinman and D. Biscotti. 2009. ‘Political Structures and the Making of US Biotechnology’. In State of Innovation: The U.S. Government’s Role in Technology Development, edited by F. L. Block and M. R. Keller, 57–76. Boulder, CO: Paradigm Publishers. Pingback: Comment: Richard Duncan’s Macro Watch – Free My Economy! Awesome, our team read your blog and so impressed from your post and i hope you keep it on in the future. Fascinating- nice to see government viewed positively for once!